Bullies Everywhere | THE GOOD . . . THE BAD . . . AND ME. There’s a story behind the word . . . behind that strength. It’s not just something I randomly throw around. It’s strangely funny how someone like me, who’s always been known to have such a strong personality can have a “bully story”. But I do and here it goes . . . Bullying, in all its unpleasantness — is evil. But what if you bully the bully? Does it make you one as well? I admit, I never can stomach someone being bullied — being hurt by the supposed “strong” people — especially when I’m around. Call me a defender of the weak or something, but I get my hackles up when I see someone tearing up or almost into tears by a group of idiotic kids or some spiteful b*tch, who can rival the evil queen any day of the week. I just can’t stand by and can’t NOT do anything. It’s human nature to go the other way when you’re not directly the recipient of such unfounded hate. You often think it’s none of your business and make an effort to get away before the all-seeing b*tch’s eye catches you. That’s the most sensible thing to do. Guess I’m not sensible at all. I lived dangerously back in school, because I’m apparently “untouchable”. I was tall for my age; I’m not part of the cool kids clique; I’m a rebel (with a cause), who hates conforming to any particular stereotype; my dad’s the president of the PTA so nobody dared messed with me; and I don’t speak unless spoken to or had to, which was menacing in a way. I have no notion of self-preservation because I know I can get away with getting back on the bullies. I don’t need to hold a metaphoric baseball bat as a weapon or make a tight fist to show how easily I can throw a mighty punch, when my acerbic tongue can cut through as sharply as any samurai sword can and do more damage than I intended. I may be a champion of the underdogs, but I’m the most hateful adversary of the prima donnas. And… I don’t care one whit. I laugh in the face of danger and I feel so empowered that I never thought I’d be subjected to bullying in my life — ever. I had my comeuppance in a place and a time in my life I thought would never happen. I thought bullying only happens in school, since adults are more mature and wouldn’t lower themselves by acting like morons and bully others. I know… I know… it’s such a naive thing to believe, but I did at that time and it resulted to a vicious awakening that I still find myself seething whenever I remember every minute detail of it. It happened when I was already an accomplished professional and decided to take a detour on the career path. So far, annoying people are just that — annoying — no one remarkable as to be tagged as a bully swerved my way. But I guess, when you tempt fate by being complacent, that’s when it hits you — in full force! 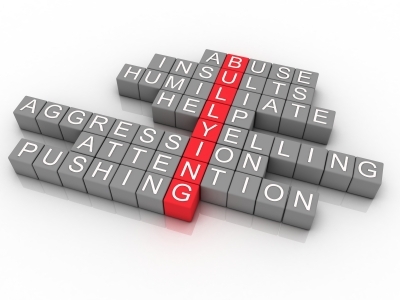 Adult bullying is bloodier and more dangerous. They’re pit vipers, who wouldn’t leave you be without drawing blood. They carry themselves as if they’re God’s gift to the world. Annoyingly arrogant, adult bullies carries years of perfecting the whole “bullying” act, so they’re almost invincible. Bullies take many forms, too. Some are just plain stupid using brute force. Some knows (or think they know) they’re so good at what they do and has no qualms in letting others know. They toot their own flute, so to speak, and are self-serving glory whores. In turn, they think no one can be as good as them so they make those who runs close to being their enemy incarnate or top competition quite miserable. They’re great fault-finders and they go out of their way to make a public spectacle of humiliating the competition. Being at the receiving end of such malicious intent one time too many from just one person, someone with a tough exterior and a sometimes soft heart like me can be affected, too. I mean, I can sometimes — embarrassingly — break down and cry. I took it to heart and in the end, it made working for that company unbearable. If not for my boss’ decision to put me in a different shift and work with a different client, I would have resigned immediately. If not for the moral support and encouragement to stay from my colleagues, who had experienced that viper’s tongue a time or two (but not as intense as I did) and had been my friends ever since, I would have immediately resigned after that public flagging (like I’m some kind of witch in the Salem witch hunt). As long as we keep the pain inside, we wouldn’t be able to heal from it and move on. I’m a firm believer that there’s always a reason for everything. My sometimes over-analytical self has surfaced that time to make me feel better about the humiliation. Urged more by motivational acts and kind words from friends, I began to view that vile person’s actions as a reflection of her fears. Unless they’re the spawn of the devil, bullies didn’t become one just because they decided upon waking up. They can be internally struggling with their own insecurities and venting it out to others because they want to feel adequate instead of the opposite. They can be uneducated about things or grew up having a different belief system that they only act upon what they know to be the gospel truth. So how do we deal with bullies big or small? Pity the bullies because they know nothing. Stand up to them by telling them so (if you have the gumption to do it). Make yourself better than them (I smirked at the viper every time I’m acknowledged for my work or get accolades from top management). Surround yourself with pleasant people so any vipers would be so out of place if they try to mix in. A snake will look so conspicuous in a flock of eagles. Toughen up and ignore. It will be less stressful if you do and makes life a whole lot sunnier. Do a confrontation. I would say make them taste their own medicine, but that’s like stooping down to their level. However, it does feel good to bring them down a peg or two by doing so, which can be a sort of last resort. This needs a lot of careful planning and a shot or two of single malt whiskey. Surprisingly, bullies can be popular people. However, they’re possibly the loneliest people in the world. They can be surrounded by a lot of people all the time, but the way they treat people will bring them into a despairing state later in life. And . . . the people around them probably are pretending to like them so they’ll not be at the receiving end of the malicious treatment. All in all, a MUST in dealing with bullies is having a tightly screwed head on, tons of gumption and the right support system (the latter you can draw strength from). Whether you’ve already experienced being bullied or not, you would need to know how to deal with it. Remember: Bullies are everywhere and bullying can take many forms. When you feel diminished, forced to do something you’re not comfortable doing, or being harassed by spiteful words or actions directed at you that eventually lowers your self esteem, that can be a form of bullying. So, there’s no reason to keep it all hush hush, never telling another soul about it. As long as you keep quiet about it, it won’t stop. So help stop bullying. Act now.